Display large scrolling text and emoticons on the screen to communicate with somebody too far away to hear you or in a noisy environment. Perfect for meeting new people at a dance club or letting your date know how you feel. Many other uses including “Thank You” messages, pranks and jokes. Upon launch, you will get the main screen showing the list of available messages as shown below. There are 2 ways to add new messages. To quickly add a message without having to specify any settings, use the “Quick Add” button on the lower left corner as shown below. You will get a dialog box where you can type your message, then pres the “Save” button. Now the message will be displayed automatically. “Quick Add” is a good option when you are in a big hurry to show your message. To be able to specify other settings, use the “Full Add” option by touching the “+Add…” line as shown below. You will be presented with the “Add Message” screen. Enter your message at the top and change other settings if needed. More detail on the other settings are described later in the “Edit Message” section. When finished, use the “Back” gesture to return to the main messages list. Now, from the main menu, to see the large scrolling text , touch the message line. When done, use the “Back” gesture to return to the main menu. To delete a message, simply swipe horizontally on the message. To change the order of the messages, touch and hold a message, then drag and drop the message to it’s new location. To change the setting for the message, touch the “i” icon on the right side of the message line as shown below. This will bring up the “Edit Message” screen. 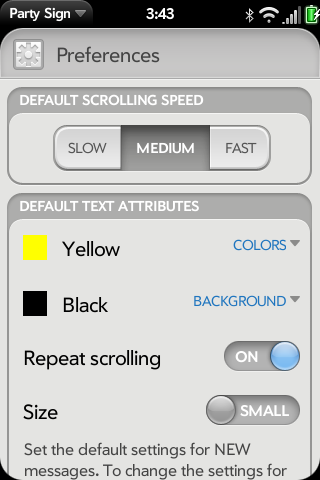 From here, you can edit the text, set the speed of scrolling, change the text and background color, and turn on the repeat feature. Turning on the repeat will cause the scrolling text to repeat over and over. You can also change the size of the text on this screen. Emoticons can be added wither by typing them directly into the message text area, or by using the add emoticons button in the lower left corner. This will bring up a list of the available emoticons and upon selection, will be inserted into your message at the current cursor position. To remove an emoticon that is already in the message, use the delete emoticons button in the lower right corner. 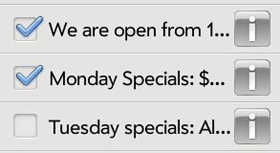 You can also use bold and underline attributes for your messages. To use, highlight one or more words by holding the Caps key and touching the word. Next, touch the “B” for bold or “U” for underline. To un-bold or remove underline, repeat the process. When finished, use the “Back” gesture to return to the main menu. pull down Menu at the upper left corner of the screen. These settings will be used for NEW messages only. This does NOT change the settings for existing messages. The “Keep Screen On” option will keep the scrolling text on and will prevent the WebOS device from going into “sleep” mode. This is useful if you want to see Party Sign scrolling text while your phone is being charged on your desk. As of version 1.2.0, we’ve added a new feature that will allow you to display multiple messages. Messages can be combined by using the checkbox selection to the left of each message (in the main messages menu) as shown below. Now when the “Show” icon is touched at the bottom right of the screen, all messages with checkmarks will be shown in the order from top to bottom. The “Show” icon is the right icon as shown below. The checkmark icon (on the left) will select ALL messages, while the uncheck icon (middle) will un-select ALL messages. The checkbox selection can also be used to change the settings of multiple messages by using the “Set To Default” option in the app menu. All the selected messages will be set to the settings that are set in the Preferences menu. The following are the selections available in the app menu (upper left corner from the main screen). This selection will show you the changes that were made in the latest release of this app. Look here first after downloading a new version of the app. Use this selection to clear out all the messages and start from scratch. Use the checkbox selection to change the settings of multiple messages by using the “Set To Default” option. All the selected messages will be set to the settings that are set in the Preferences menu. Under this heading are “Backup” and “Restore.” Use the Backup feature to save all your messages to your Google Docs account. If you do not have a Google Docs account, there is an option in the Preference to email your backup to yourself. Use this screen to change the default preference for your new messages. Note that this does NOT change the settings for your existing messages. If you do not have a free Google account, but still want to backup your messages, set the setting to “NO.” This will allow you to email your backup to yourself. Information on how to use this app. Use this selection to see comments and questions left by other users and the option to submit your own comments. Use this to see if there is a newer version of the app available in the Palm App Catalog. While the text is scrolling, you can flick your finger on the screen to speed up the scrolling or rewind it back, depending on which way you flick. You can also “drag” the text by moving your finger on the screen left and right and the message will follow your finger’s direction. You can also flip the device 180 degrees and the message will automatically flip. If you want to automatically display a message when you open the app, minimize and close the app while the message is scrolling on the screen. Now, when the app is re-opened, the message will automatically be displayed again. This will save the screen as an image which can be viewed with your “Photos” app. Then save as wallpaper by touching the icon on the lower left corner as you would any other picture. Note that the saved image is static and will not scroll. Q: What do I use this app for? A: There are many uses for this app. For students, use it to send messages to your classmates while your teacher isn’t looking. At work, use it to send messages to your co-workers. 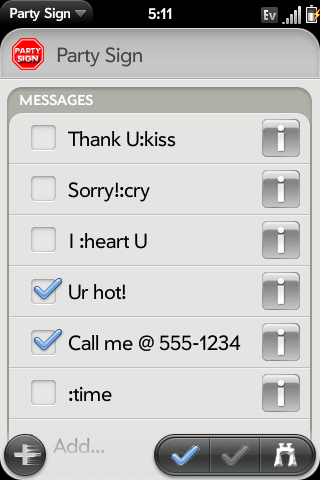 At a dance club, send messages to that hot guy or girl. Send messages to people in other cars on the road to prevent road rage. Send a love note to your spouse from across the table. Q: How do I send a message via SMS or email? A: We are working on this feature but currently, there is no way to send a message that way. Q: Sometimes the scrolling is not smooth. What can I do? A: As of WebOS 1.4.1, and Party Sign 1.4.1, there should be a reduction of the stuttering during the scrolling. However, it is recommended that you close all other non-essential applications running on your Palm. If you find that it still runs slowly after closing all applications, reboot your Palm by pressing the keys ORANGE+SYM+R simultaneously. Q: What’s different in the new version? Q: Are there any other secret emoticons? Color selection shows sample color and emoticons selection also shows sample emoticon. App menu now features “Backup” and “restore” under “Tools.” This new feature will allow the user to backup the messages to (and restore from) their Google account. If the user does not have a Google account, there is an option to send the backup to themselves via email. Edit messages now uses multi-line mode (larger text area) for editing longer messages. Use :miltime to get military time and :date for current date. Submit discussion comment fixed and options to see older and newer comments. The first letter of the message is no longer automatically capitalized. Remove emoticon button added to edit screen to remove emoticons from message. “Set To Default” option added to app menu to allow user to select messages to set to default settings from Preference screen. Message with only emoticons are now centered correctly vertically for all sizes. Using app menu while editing message works properly. Quick add with only spaces is now ignored. Changes for WebOS 1.4.1 to reduce scrolling stutter. Added option for large text. New colors Deep Green, Deep Indigo, Garnet, and Mint added. Problem with messages not saving properly the first time app is used has been fixed. Quick Show: After “Quick Add”, the new message is automatically shown. New color “Neon Green” added. Added feature to remember last message on app closure. To use, minimize while message is scrolling, then close app. When app is re-opened, the message will automatically be displayed again. Blank messages are not added. Option to keep screen on in Preference. Use this to show messages while charging. Checkmark messages to combine multiple messages together. Quick add and full add messages now available. Using special characters and multiple spaces now work properly. Add emoticon via submenu on blank text field fixed. Messages can now be reordered by drag and drop. Brown, gold, gray, orange, pink and purple. 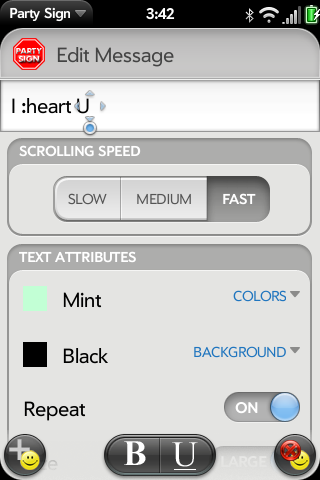 Background colors selectable in Preference and “Message Edit”. New emoticon selection submenu added to “Message Edit”. “Delete All” now works properly. Repeating same emoticon in one message now works properly. You can save a static version using SYM + ORANGE + P, but you cannot save a scrolling version. Sorry. On the Pixi, it&apos;s the button to the left of the "Z" key. -sigh- uh, still hoping for that update with the "mil.date" and such. Hoping it&apos;s soon. please? How do I add it as my wallpaper because it said,&apos;&apos;orange sym p&apos;&apos; what it orange!!! On the Pixi, that is the key to the left of the "Z" key. I&apos;m not sure I understand your question but to add new messages, you can either use the quick add (lower left) or touch the "+ Add.." line. For more info, touch upper left corner, then "Help", then "How To Use"
Congratulations on Hot App! Can you please add :mildate (dd Mmm yyyy) and :weekday ? Thanks for keeping the fire under me to keep me motivated. I&apos;m really going to try to get it done this weekend. How can I send friends the party signs I make? Can I send this as a message? We are working on that feature. How can I delete this app???? To delete this (or any) app, hold the ORANGE button (or gray on pixi) to the left of "Z" then touch the app you want to delete. We are working on that feature but it is currently not available. Is there an ability to make short messages (like "hi!") static instead of scrolling? Yes. After adding your text ("hi" in this case), touch the "i" icon to go into edit mode of your text. Turn off "Repeat", then swipe to get back to main menu. Now select your text to display it. It will still scroll onto the screen but will stop when it is completely visible. If you want to position your text, you can "drag" it left or right by touching the screen. You can have a static copy of the Party Sign image as your wall paper by pressing ORANGE + SYM + P simultaneously. How do you send someone ur party message??? If you mean via Text messaging, we are working on this feature for a future release. Any chance of making a version for android? Please! We don&apos;t have plans to go into the Android market at this time but perhaps in the future. We have launched a web based version that can be used from any smartphone. I added the message…now how do I send it through a text message to someone in my contacts list? Sorry but that feature is not available yet. Sorry, you can&apos;t do that yet. How can I send this to my friends? I love this app it is the best ever! There is currently no specific time frame when there will be another update. There are currently no plans to continue work on this app. We have launched a web based version that has a "Share" option to allow you to send a link via text message. When the other person touches the link, they will get the scrolling message. I&apos;m a big Big Fan. Is there anyway you can add cross-app launch capability? Would you consider transferring development or letting me add to it? Or possibly make the app open source? I like this idea a lot. I&apos;m working on some other stuff right now but I&apos;ll be sure to put this on my to-do list. 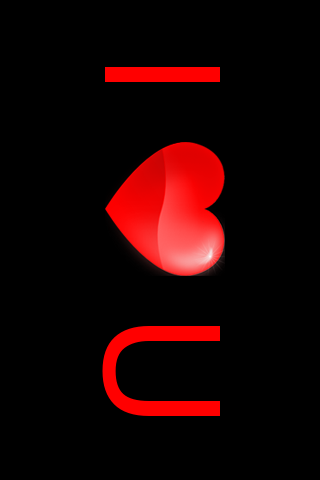 Do you have any plans to develop this wonderful Party Sign app for the android operating system? I used to own a palm pre phone and I loved this app. I now have an android phone and I would love to have this app on my new phone. Currently, we don&apos;t have any plans on moving this app to Android. We are currently working on another project. We have launched a web based version that can be used from the any smartphone including any Android based phone. hi, can this go full screen on the touchpad? I haven&apos;t looked into it but I would have to make some minor modifications. However, currently we are not doing any development on this platform. Sorry but we have stopped development work on this app for now. We have launched a web based version that can be used from the iPhone.